when i excute worldserver.exe after config and import the database, the app crash and print the error log: ERROR 1054 (42S22) at line 21: Unknown column 'OptionID' in 'field list'. in the code, the red word 'root' is 'trinity' originally, the red word '123456' is also 'trinity' originally. and after i excute the worldserver.exe, the app print error log ang crash. the results of worldserver.exe and authserver.exe is shown in the picture. enable autoupdater and leave core to do the job, if you don't want download latest TDB for master branch and apply every sql on updates directories. The worldserver crashes whenever I create a character. Seems like there is an issue with mysql, but I have no idea what the issue is. Anybody knows what`s happening here? 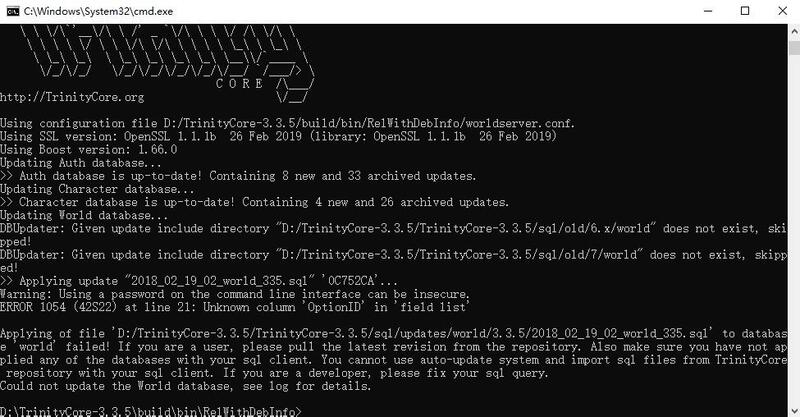 I am developing on a Trinitycore based 5.4.8 core. We are exeperiencing multiple crash from different points. I suspect that these crashes can be handled from a single point that corrects every GetGUID crashes. Here is the pastebin of the crashlogs. "Unable to open DBFilesClient\MovieOverlays.dbc: Can't find file in build manifest"
Could this be related to the update to 6.2.2 that happened earlier today? I wanted to post this here in case it was some silly mistake I made before I put it on the issue tracker.